It was interesting to see a movie that does not only glorify the missions we take part in around the world. I would like to see more of these kind of movies. DiCaprio, playing the lead role, really impressed me. Mark Strong, playing the head of the Jordanian intelligence, is really cool - both actor and character. It is absolutely worth the time, and I believe that I might watch it again some time. I saw this movie in the cinema Saturday, and I must say that I enjoyed it. But then again DiCaprio is one of my favorite actors... so all wrong it couldn't be all bad. 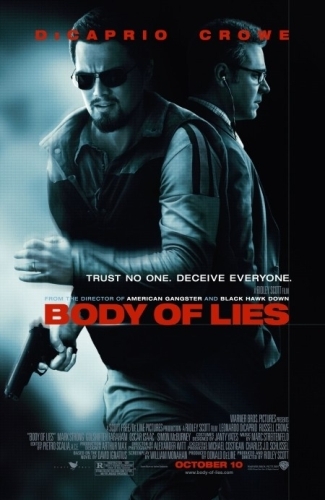 In this movie he plays an CIA agent who's operating out of Iraq and he discovers a new terror cell there, and the movie is about his findings and his struggle with the Americans politicians. Ridley Scott has done a very good job here, with great dramatic story and some very impressive action scenes. I was a little bit disappointed about Crowe's part, but then again he's not my favorite actor, so I didn't matter to me that he didn't have lead role. I'll put 8 of 10 out there for this very well put action/drama flick. Which has great acting and a very believable plot.